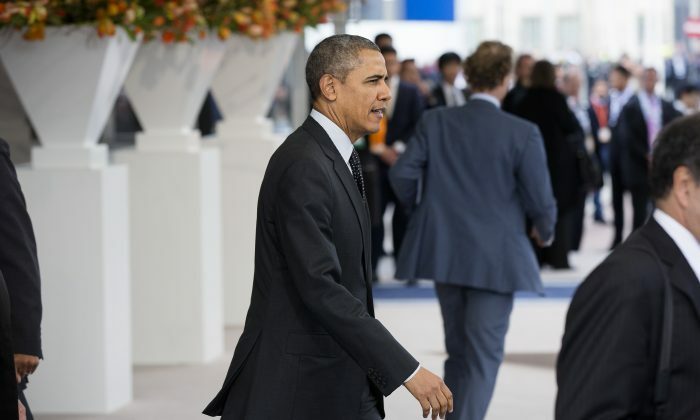 NEW YORK—At a Nuclear Security Summit in the Hague, Netherlands on Monday Obama raised alarms by saying he was more worried about a terrorist attack on New York City than any threat from Russia. “Russia’s actions are a problem, they don’t pose the number one national security threat to the United States. I continue to be much more concerned when it comes to our security with the prospect of a nuclear weapon going off in Manhattan,” he said at a press briefing after the conference. He was responding to a question about Mitt Romney’s statement during his 2012 presidential campaign that Russia was the United State’s biggest geopolitical threat. When asked to clarify if there was a nuclear threat the public was not aware of, a White House spokesperson told Bloomberg News it wasn’t meant as an indication of a real threat, and that Obama was merely using it to illustrate a point. After the president’s comment, Sen. Charles Schumer (D-NY) used it as fodder to protest funding cuts to a nuclear detection program in New York City. The program, called “Secure our Cities,” funded through the Department of Homeland Security [DHS], would be cut from $11 to $4.7 million for FY 2015. According to Newsday, Rep. Pete King (R-Seaford) expected funding for other programs to go up, such as the Homeland Security Urban Area Security Initiative grants, and another grant to the State. At an awards ceremony on Monday, former Police Commissioner Ray Kelly said he was glad the president was taking the threat seriously. “I don’t think we should sugar coat the threat. We’ve had 16 plots against the City since Sept. 11th. They’ve been defeated because of good work on the part of the federal government, good work on the part of the NYPD, and luck,” said Kelly. Former Mayor Rudy Giuliani, who introduced Kelly as he received the “Americanism Award,” presented by the Anti-Defamation League, agreed, saying the threat is as real now as when he was in office. Giuliani said that despite New York City being a prime target for terrorist attacks, downtown Manhattan has rebounded since 9/11 with almost twice as many people living there as before.